I think one of the reasons people love Lucio Fulci’s The Beyond is the fact that it Is absolutely insane for the first half of the film. It often feels as though it doesn’t even make sense. It’s so nutty in fact, we know we’re going to see some disgusting gore and nastiness dripping from corpses, but it still doesn’t sink in that we’re watching a zombie movie until we move into the final act and Fulci unveils all the shambling dead. But here’s where it gets interesting: I don’t think we’re really supposed to truly grasp the fact that we’re watching a full-fledged zombie flick, anyway. We learn that a lovely young woman has inherited a creepy old house, and we know it was built upon an entrance to Hell. So, for a bit there, we really just anticipate the arrival of a myriad of demons, especially as the gore begins piling up. These can’t really be zombies… can they? They can. And, they’re disgusting, which is another interesting thing about Fulci and his films. Rather than hitting typical beats or including sequences that propel the story forward, he feeds us copious amounts of gore that just seem to intensify as he works toward a blood drenched finale. And Fulci’s finales are no doubt a blast, and arrive with the viewer fully expecting some nauseating practical effects. I’m not sure the man ever let down in that regard. What I’m saying, in somewhat truncated form is this: Lucio Fulci wasn’t always concerned with telling a smooth, logical or believable story. He used grotesqueries to move his narrative along, and if you know that heading into a film like The Beyond, you’re going to have a blast. I always have and I always will carry a lot of love for this film. It’s stuffed with so many outlandish sequences it’s almost unbelievable. The special effects are still amazing today. From the nail through the eyeball to the zombie dog feast, there are a lot of moments that leave us, the audience, just flabbergasted in the greatest of ways. 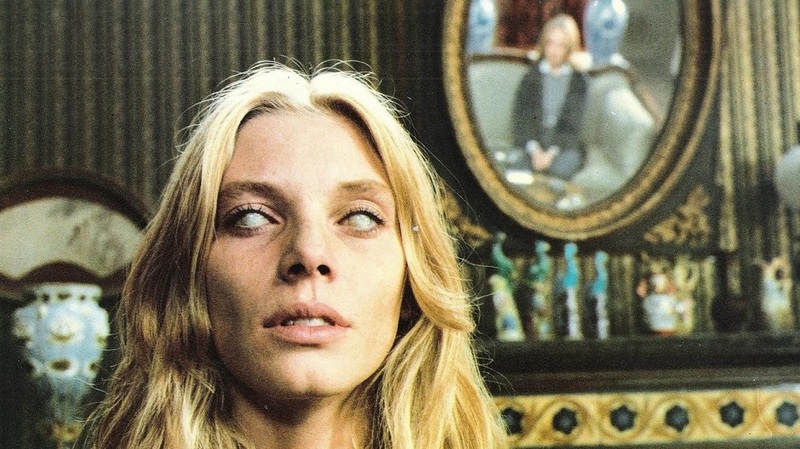 I often see younger, or unfamiliar fans compare Fulci to Dario Argento, and if you’ve walked around with the idea that they’re similar filmmakers, you’ve been – for the most part – fooled. While Fulci and Argento share some cinematography tricks (The Beyond has some absolutely gorgeous shots that toy with color contrast and dabble with visual perception, and Argento did do that, but that’s about where the biggest similarities end), they’re radically different visionaries. Fulci wanted to force you to stare at the face of the nastiness, while Argento typically (he did become more graphic in some of his later works) enjoyed leaving that horrific violence up to the viewer’s imagination. They’re definitely very different filmmakers – both excellent in their own right – but who you choose to check out depends on how repulsed you hope to be. If you’re feeling nasty, jump into Lucio Fulci’s filmography. And what the hell, start right here, with The Beyond, a terrifically creepy and super disgusting picture that taps a nerve in this old viewer!